From left to right Nicholas Temple (Gentleman), Kevin Dykstra (Voltaire) and Karen V. Lawrence (Emilie). Photo by Harvey Levine. Voltaire once wrote, “We should be considerate to the living; to the dead we owe only the truth.” Playwright Lauren Gunderson has done exactly this with a fascinating trip through time and space where Emilie Du Châtelet (played by Karen V. Lawrence), a brilliant 18th-century philosopher, mathematician, physicist and author, revisits her life, her merry moments and her darkest hours. Emilie’s untimely death at 42 due to childbirth left much of her work incomplete. Gunderson’s story takes Emilie back through the various stages of her life in hopes of finding some resolutions to the questions she left unanswered. 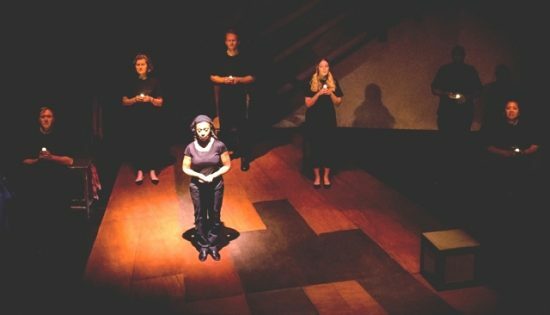 Director Erin Bone Steele has orchestrated a beautiful play that brings the elements of love, disappointment, passion and determination into a harmonious dance of wonder. Her defiance of social norms is on full display and I could not help but feel her frustrations embattling the cultural expectations that inhibited the acceptance of her work she clearly deserved. Her marriage to the rather tolerant Marquis Florent-Claude du Chastellet (Peter Orvetti) allowed her to take Voltaire (the great French writer and philosopher, played by Kevin Dykstra) as a live-in lover and collaborator. Emilie’s affinity for the sciences in the face of misogyny and triumphing through the obstructions at every step was a little bittersweet. She faced the notion of simplicity equaling happiness (something her mother insisted), which dawned on her as the sun began to set on her time in this world. What I love about this play is Gunderson literally gives Emilie a stage to illuminate the world once more about her understandings in the field of physics. Though her boldness and passion for science did not come without its price, Emilie’s vindication pierces through in this intellectual debate of love versus philosophy. Director Erin Bone Steele has orchestrated a beautiful play that brings the elements of love, disappointment, passion and determination into a harmonious dance of wonder. There are actually two Emilies in this play, Karen V. Lawrence, who plays Emilie in the afterlife and the central figure, and Sienna Goering, who plays the living Emilie. Most of the interactions happen between Emilie (Lawrence) and Voltaire (Dykstra), and their chemistry was not immediate, but it became a little more believable as the play developed. Set designer Jeff Asjes gets a nod for the antiquated ambiance of the setting. Costume designer Jennifer Georgia also deserves some praise for the choice of clothes appropriate for the 18th century time period, though it would have been nice to have the two main actors change outfits at least once. The music and stage crew were perfect in transitions, so much credit is given to stage manager Alika Codispoti. Overall, I loved this performance and praise the production staff for a lovely presentation. Emilie is as cerebral as it is coy about love, fondness and reason. It touches the heart and opens the mind, and delves into the life of a luminous woman whose genius exceeded the expectations of most during her life. I don’t believe it is hyperbole to say she impacted not only everyone in her world but the world at large. 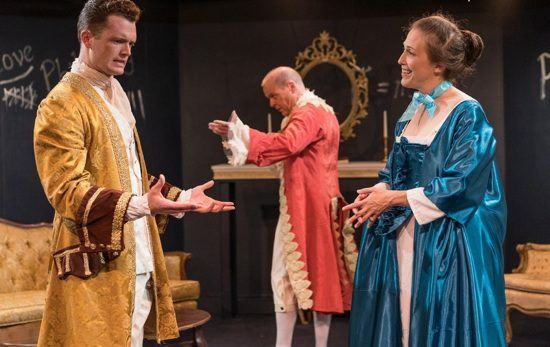 “Emilie La Marquise Du Châtelet Defends Her Life Tonight” is playing now until October 6, 2018. For more information about this play, to purchase tickets and learn more about Silver Spring Stage, click here.